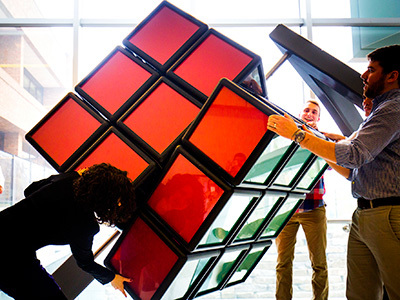 Giant Rubik’s Cube installed at U-Michigan « Adafruit Industries – Makers, hackers, artists, designers and engineers! The University of Michigan is installing what it hopes to be the worlds largest Rubik’s cube of its kind. A giant Rubik’s Cube newly installed on the University of Michigan’s North Campus is believed to be the world’s largest hand-solvable, stationary version of the famous puzzle. The colorful, new cube is meant to be touched and solved. The students worked hard to figure out a movement mechanism that would enable that. They realized they couldn’t simply scale up the approach a handheld cube relies on because the friction would be too great. So to keep friction minimal, they devised a setup that utilizes rollers and transfer bearings.